Honor and shame are innately social and cooperate realities. For this reason, an honor-centric morality prioritizes relational harmony and communal edification, as seen in Pauline theology. John Barclay says, “Paul’s redefinition of honor thus gives prestige to such traits that promote social cohesion and mutual construction” (2014, 313). Victor Furnish explains, “For [Paul], moral action is never a matter of an isolated actor choosing from among a variety of abstract ideas on the basis of how inherently “good” or “evil” each may be. Instead, it is always a matter of choosing and doing what is good for the brother and what will upbuild the whole community of brethren” (2009, 233). First Corinthians offers an apostolic case study of an honor-centric ethic, which approaches morality different than the West’s guilt-based paradigm. The formation of God’s covenant community is Paul’s moral vision and ethical telos. Richard Hays notes, “The ethical norm, then, is not given in the form of a predetermined rule or set of rules for conduct; rather, the right action must be discerned on the basis of a Christological paradigm, with a view to the need of the community and the community’s identity as God’s covenant people” (Hays 1994, 37). So for example, when certain Corinthians approach the issue of idol-meat as an individual right, Paul reframes it as a matter of community construction (1 Cor 8). Paul’s moral instructions to the Corinthian community are not rules defined by Old Testament Torah, Roman law, or the upholding of universal moral justice. They are more akin to guardrails keeping Christians on the path towards relationships, community, and honor. “Whatever you do, do it all for the glory of God” (1 Cor 10:31). For Paul, glorifying God meant giving no offense to others and striving to please all (1 Cor 10:32). Shaming, demoting, or offending someone for whom Christ died nullifies God’s work. Relational harmony and communal unity are what glorifies God in 1 Cor 10:31–32. 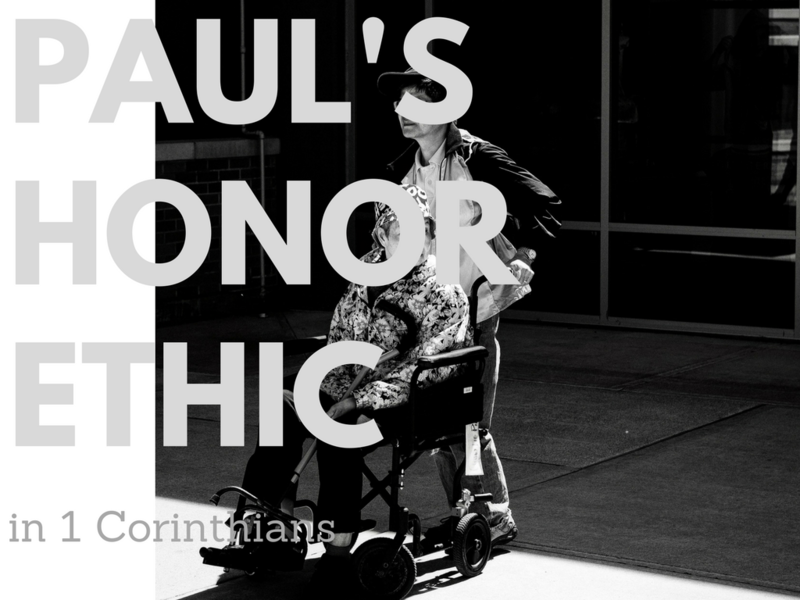 For Paul, the end (i.e., glorifying God) and means (i.e., pleasing others) of Christian morality are honor-shame based. Paul’s teachings on head coverings in 1 Cor 11:2-16 offers another example honor-centric ethics. Note the repeated honor-shame language: Every man who prays “with their head covered dishonors his head” (v. 4) “since he is the image and glory of God” (v. 7), and long hair “is a disgrace to him” (v. 14). The women who prays “with her head uncovered dishonors her head” (v. 5), and since a woman’s long hair “is her glory” (v. 15) “it is a disgrace for a woman to have her hair cut off or her head shaved” (v. 6, emphasis added). What is honorable is right; what is shameful is wrong. In this complicated passage, Paul appears to be denouncing the Greco-Roman liturgical practice of male head-coverings because they reflected a cultic custom in the pagan temples and indicated hierarchical social prominence. But Paul mandates female head coverings as social symbols of distinct gender boundaries, moral propriety, and sexual modesty (Finney 2010). But regardless the cultural background, we can’t miss Paul’s blatant appeal to honor and shame in these instructions. Paul does not discard honor and shame as moral rubrics, but reframes them for God’s community in Corinth. His example can help Christians develop a complete and biblical social morality for the people of God. This post is adapted from my article “They Don’t Feel Guilt?!? !” in Restored to Freedom from Guilt, Shame, and Fear: Lessons from the Buddhist World (SEANET 13; William Carey Library, 2017).